I use a method of cash management that I've cooked up over several years of trial and error. It was inspired by a great book I found referenced in the footnotes of a terrible Robert Kiyosaki book (that said, I haven't read a good Kiyosaki book...) called, The Richest Man in Babylon by G.S. Clason. In that book is described a method of personal financial management that is very simple: take your entire income, allocate 70% of it to "living," 20% to paying off debts, and the remaining 10% is directed to investments that are "inviolate" - you never cash them out or spend that money. I ran with the basic system for quite a while and it worked wonders for me. My consumption came under control, my debts began to shrink and my net worth steadily increased. Little by little I began personalizing the system though. I had questions about what to do with "left over" amounts - should one keep separate ledgers for each of the three categories and roll over remaining balances in each when the next pay day rolls around? What about the investments? Clason preached reinvesting all interest and dividends and only tapping that income stream when one is too old to work - what if one doesn't live that long? Why not tap the income now while leaving the principal alone? Little by little, these questions led to the development of my hybrid Richest Man in Babylon personal finance management method (I haven't come up with a snappy name for it yet). It's a bit difficult to explain quickly, which sometimes frustrates me when I'm trying to explain it to people. I was thinking about that today when the idea occurred to me to flow chart my method. As you can see, at the core of the method is Clason's idea, the three categories broken down by his recommended percentages. The investment and debt categories are obvious; "living" encompasses everything you do in day-to-day life - eat, go to the movies, drive your car, etc., and all of the related expenditures. Clason's prescriptions really did end at this point, however, so I added some features to tie up what I saw as loose ends. The result is something that I believe can push itself past the point of requiring inputs (new capital) and can continue to grow on its own, barring human error. It all begins on the left with wages, money from blogging, "windfalls" (found money, lottery winnings, legal settlements, etc. ), which are the "inputs" into the system from outside sources (not cash generated within the system loop itself - more on that later). Initially, the system will not run without regular, steady inputs (sorry, you've still got to go to work for a while!). Together they enter the system as "income." Income then gets divided into the three categories already mentioned. When it comes to the living allocation, after using Clason's original method for a few months, I found myself at a point where I had cash left over from a previous pay period in this category when the next pay period rolled around. At first it seemed great that I could just roll leftover cash into the category in the new pay period, but I noticed "boom and bust" cycles developing in my spending habits - when this category swelled, I started living it up, and eventually I would find myself reduced back down to just the 70% of my latest pay period. This is fine in one sense because I had created no new debts, but I didn't like being able to have fun one week and then be "in the black" but stuck at home anyway in the next. That's when I came up with a notion of creating my own "paychecks" out of remaining balances from this category. My idea was to shuttle remainders off to a money market account if a remaining balance existed in the living category each pay period. Then, in between normal pay periods, I would divide the balance of the money market account by 26 - the number of pay periods I have per year currently - and draw the resulting amount, which then gets sent back to the income stage of my cash flow process and allocated among the three categories. The result is that irregular periods of plenty get spread out over one year's time rather than feeding boom and bust cycles, which have been all but eliminated from my financial life by this, and my debt and investment activities get a small boost since a percentage of these money market account withdrawals is allocated to them. Additionally, if something unexpected comes up that would exceed the cash in the living category - car repair, Christmas gifts, a new electric fireplace for your living room (yeah, I want one) - this account can be raided to provide for such things. This account is, after all, a pool of money that exists because of and for deferred consumption (but don't use that as an excuse to constantly raid the account!). In the debt category, the only question I've ever had is, "what does one do with this category when there is no debt to pay off?" One couple in Clason's book who wrote about their experiences using his method desribed reallocating their income into just living and investing, at 80% and 20% respectively. This idea makes sense given Clason's admonitions to never touch the principal nor the interest and dividends of one's investments until old age, but for the way I treat that category (more on that in a moment), it made no sense at all - it gives one an increased standard of living from wages, but what about investing more while simultaneously having more money for living and potentially working less now? (Not to mention that one's wages might be stagnant for an extended period of time, meaning no increasing standard of living in the present). 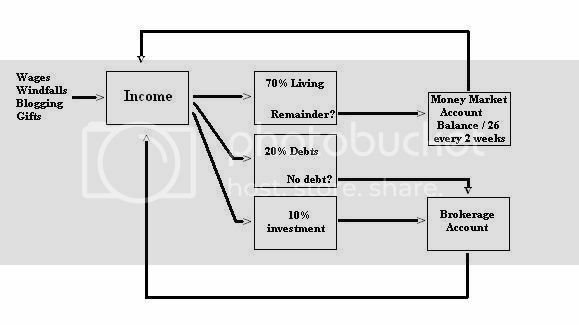 Instead, my plan is to divert the full debt category percentage into investments, achieving a 70% living and 30% investment cash flow allocation split, which will slowly increase the actual amount of the living category over time, as I'll now explain. I like investing for income. I understand and appreciate compounding, and I know the advantage and benefits of pursuing capital appreciation; as such, I have accounts where that goes on, namely my IRA account that I have through work. Outside of that though, I prefer to pursue passive income investments that pay me now. My reasoning for this is rather simple: though the long term gains of such investing may be smaller relative to longer term, non-income oriented investing such as growth investing (and this is frequently the case), I am alive now, I may not be tomorrow, and I can boost my income and standard of living now by pursuing such investments whereas the other type offers a payoff at a point in time in which I may not be here anyway. Plus, pursued regularly and systematically, passive income investing can within one's lifetime reach a level where it continues to grow on its own even as it throws off more income than what is required to sustain one's day to day living. I think you see by now where this is going. Done right, I believe my method builds an ever-increasing income and standard of living, and my own experiences prove to me that this is the case. When I say "done right," however, I mean that, as there are several things that can derail this method: overspending in the living category increases debt; increased debt can lead to a situation where 20% of one's income is not enough to cover the payments, and having debt in the first place slows the growth of one's passive income; rash investment decisions can compromise your passive income stream and/or wipe out your capital, etc. This is no "autopilot" method; there needs to be an engaged human brain involved, a willingness to delay gratification, and patience.